With a heavy focus on Arena combat, Ratchet and Clank: Full Frontal Assault pits the familiar faces from the long running series into a series of MOBA-like battles. Ratchet & Clank: Full Frontal Force (Ratchet & Clank: Q Force in Europe and Australia) is a PS3 and PlayStation Vita entry in Insomniac's long-running Ratchet & Clank series. Ted Price, the CEO of Insomniac Games, announced the game on May the 30th 2012. Ted said that it would be available for download exclusively on the PlayStation store. It would be a return to form and control like classic Ratchet and Clank games did. It would also be co-op and have online play and be the 11th installment in the franchise. A private beta was run for Playstation + members from late August to the 9th of September, codes were later give out from Insomniac games and the Playstation Network. It collected various data and featured one playable map. 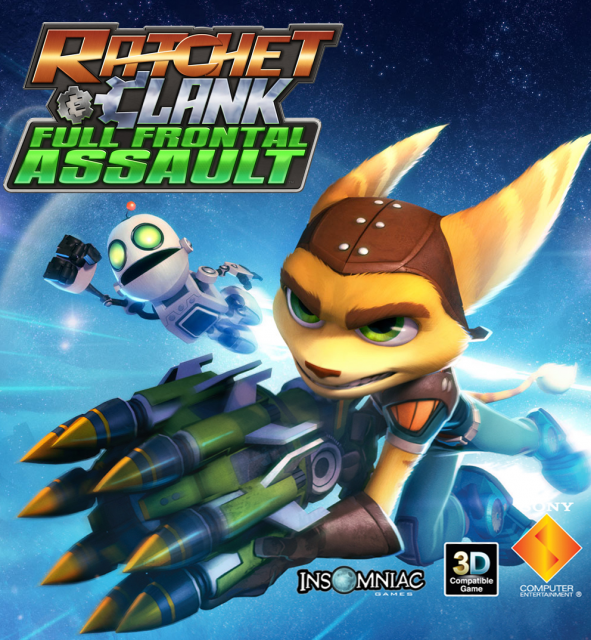 The game puts Ratchet and his team back in The Q-Force, which has not made an appearance since Ratchet and Clank 3. (Or Deadlocked/Gladiator but it was never mentioned.) The team members present are Ratchet, Clank, Captain Qwark, The Plumber, Barry (Starship Phoenix II's AI) and three robots Blip, Bleep and Bloop. Things are quiet in the galaxy, until Ratchet is approached by Sergeant Zurgo who expressed a hatred for Captain Qwark and vowed to take him down. Zurgo had taken over the defense system for multiple planets, The Q-Force went to these planets and took them back, admits all of this Zurgo revealed himself to be Stuart Zergo. Stuart Zergo was the Q-Force fan that Ratchet and Clank encountered in Ratchet and Clank: Going Commando: Stuart used to idolize the Captain, but afterwards he discovered Qwark was not the hero he thought he was. He then set out on a mission to kill Qwark. The team found a distress call on a small planet, when they got there they found The Plumber. He needed help fixing something, however The Plumber didn't know anything about The Q-Force. When they got back to the Phoenix they discovered that The Plumber on the ship was Zergo in a Hologuise. He then used a Hologuise to make himself Captain Qwark, he rang up the emergency services declaring that he was about to take down a planet's defense system. The team set off to take him down, they met him and bested him at planet Balkai. He was then taken by Qwark, who then dropped him into a fiery pit accidentally. The single player is a mixture of tower defense, exploration and shooting. Ratchet starts off in the Q-Force base, and sets off into the planet finding weapon pods and killing enemies, every so often he will be told that there are enemies coming to his base to destroy the power cores. The game ends once all the power cores are destroyed. The player can spend bolts of barriers and turrets and over defenses to keep enemies away. The goal is to get to follow the objectives until the Q-Force can retake the planet's defense system. The multiplayer has 1V1 and 2V2, one team starts on one base and the other team on the other base. Each base is the same as in the single player, but throughout the map are node points which can be taken furing the first stage which is the recon stage. In this stage the player (And their teammate) will try and take as many nodes as they can or stop the enemies taking nodes. Then after a few minutes the squad phase will start. This phase gives the player access to the enemy selection screen in which the player can spend bolts on units that they can send to the enemy base to attack it, throughout the base the player can also again get turrets and barriers. Then the assault phase starts. In this phase the main barrier to the base is down so the enemies can charge the base and attack, so can the player. Nodes can not be taken during this time, but the player can clear out the enemies surrounding the nodes to make it easier to take them once the recon phase starts again. This will keep going on until all the generators in the base have been destroyed or until the player has destroyed theirs. If the player takes too long the Full Frontal Assault phase starts: this is the assault phase but it will not go back to any other phase. If the player wins a match they are given points that will increase their rank. The game can also be played co-op - the story mode seems to have been designed with this in mind as it does not scale down if the player is playing solo. The game is one of the game that features Cross Play Support, so the player can fight against somebody on the Vita version through the PS3 version and vice versa. It is also apart of Sony's Cross Buy program so if the player has the PS3 version they receive the Vita version for free. The Vita version was released a few months after the PS3 version in the Spring of 2013, and when released those who downloaded it on day one also received a digital copy of Ratchet: Deadlocked for free. There are a number of cosmetic DLC items for people who want skins to use in multiplayer and these skins are in a three-pack and themed. The classic pack features Helga, The Plumber and the Hotbot. Metropolis was later released as free DLC as a new map.